The Dream of a girl comes true when she wakeup. A Decent story based song composed by JRD Records and sung by Renuka Panwar directed by Noneet Verma & camera by Amit Bishnoi is a beautiful combination. It's produced by Alok Rai & presented by Kala Niketan Entertainment. 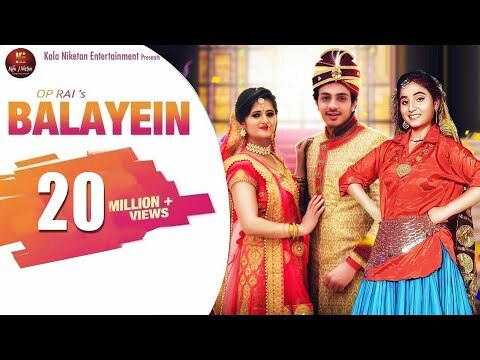 Kala Niketan Entertainment Presents OP Rai's BALAYEIN Singer : Renuka Panwar Lyrics : SKL Jindwal Starring : Anjali Raghav, Diler Singh Kharakiya Co-Artist : Joginder Kundu, Saroj Jangra , Baby Tyagi Music : JRB Records Makeup : Rashmi Deval DOP : Amit Bishnoi Edit : Raj Gurjar Grading : Vicky Taak Dance Group : Aliza & Team Costumes / AD : Nav Nain Stills : Rajat Pai Concept / Screen Play /Direction : Noneet Verma Label & Copyright : Kala Niketan KALA NIKETAN ENTERTAINMENT ( a PRIME member of IMPPA & WIFPA , Mumbai ) is a Delhi-Mumbai based film production & film distribution house . Besides films company is also producing video songs , music , short films & web serials .